Studio Cast, 1997 (JAY, 2CDs) (3 / 5) Sumptuously produced, this complete recording of the score may be too inclusive. 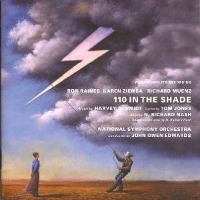 With John Owen Edwards conducting England’s National Symphony Orchestra, every note that was missing from the original Broadway album of 110 in the Shade is heard here, including a pointless soft-shoe interval in the already dull “Everything Beautiful Happens at Night.” An appendix offers a couple of songs that were cut from the show, and some other slightly rethought ones. But what this recording can rightfully boast over the original is a suitable Starbuck: Ron Raines is vocally velvety and a hell of an actor, capturing both this con man’s bluster and the self-doubting poet underneath. In the role of Lizzie, Karen Ziemba is persuasive as a plain woman terrified of becoming a spinster, but she’s somewhat insecure in her upper register — most noticeably when she sings the Act I finale, “Old Maid,” which should be a tour de force. Richard Muenz is fine as File, and the supporting cast is first-rate, particularly Kristin Chenoweth in the Lesley Ann Warren role. — M.M. 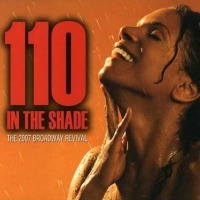 Broadway Cast, 2007 (PS Classics) (3 / 5) Audra McDonald had a go at 110 in 2007, under the auspices of the Roundabout Theatre Company. Hers is the best-acted, best-sung Lizzie I’ve ever heard; her terror in “Old Maid” and her yearning in “Simple Little Things” are palpable, and her vocalizing is sublime. 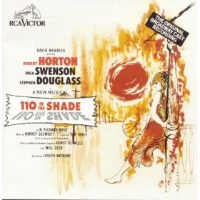 However, this album isn’t an unmixed blessing: McDonald is saddled with a charisma-free Starbuck in Steve Kazee (though he does all right by “Melisande” and is helped somewhat by the inclusion of a cut song, “Evening Star”), and her File, Christopher Innvar, embodies this dull, dutiful character a bit too well. The new orchestrations, by Jonathan Tunick, sound skimpy. McDonald gets gentlemanly support from John Cullum as her father and Bobby Steggert as her brother Jimmy, and generous connecting dialog helps flesh out the narrative. — M.M.